The year was 1990, the World's fledgling telecommunications network had yet to bring vast swaths of the global population online. The infrastructure required for the Internet had not yet been developed in Africa, and billions of people around the world had not even seen a computer. In short, the journey could only be uphill from there. But nature abhors a vacuum, and the space for an African net was no exception; the decade would see the introduction and development of the Internet's infrastructure by the pioneers of the net within the continent. Today most people who register a domain on the net are familiar with ICANN. The Internet Corporation for Assigned Names and Numbers was formed in 1998. It is a not-for-profit partnership of people from all over the world dedicated to keeping the Internet secure, stable and interoperable. It promotes competition and develops policy on the Internet’s unique identifiers. ICANN coordinates the Domain Name System (DNS), Internet Protocol (IP) addresses, space allocation, protocol identifier assignment, generic (gTLD) and country code (ccTLD) Top-Level Domain name system management, and root server system management functions. Essentially, it gives a unique address to everyone on the world wide web. The partnership was created in 1998, when it took over many of the essential duties of the Internet Assigned Numbers Authority (IANA) and other entities under contract of the U.S. Government. 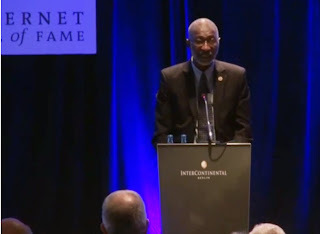 Dr. Nii Quaynor was the first in the ICANN board of Directors from 2000 to 2003, and although many other people contributed to the development of the net in Africa, he is most considered to be the individual that can most closely be described as the 'father' of the African net. In a recent interview for CNN, Dr. Nii Quaynor recalled those heady days before the advent of the African net. In 1996 Quaynor, who had been among the first class of African students to earn computer science degrees in the 70's, saw the potential of a market for internet connections in Ghana. He and a few colleagues set up a server and offered the first internet hosting service in the country, thus creating the first internet connections in Africa. Use of their system quickly grew, and word of the hosting service spread around Ghana and to other African countries who were equally eager for the introduction of the net. Quaynor further encouraged the growth of the net in the 2000's by playing an instrumental role in creating the institutions which constitute the structure of the Internet in Africa. His efforts facilitated the ordered allocation of net services and resources, and proper integration with the world wide net. Today the Internet resembles a global village, and Quaynor says this was by design as the early inventors of the various components of the net put thought and consideration into what the system would become in the future. Dr. Quaynor has said that he believes the very spirit of the Internet is conscious of the fact that the world is one. This belief under lied his actions in the late 90's as he and his colleagues were building out their hosting service; as soon as they got the net going in Ghana, he quickly took steps to facilitate the sharing of the technology with other countries, going out as an evangelist of the internet. It's safe to say that Quaynor's efforts fared very well, as today Africa has joined the global community of the net in earnest, and is one of the fastest growing segments of the internet. Technology has been the basis for radical change throughout human history, and undoubtedly the advent of the world wide web has had perhaps the most profound effect on humanity of any technology in history. As the multitude of cultures within the 55 countries of Africa is increasingly influenced by the paradigm shifting disruption of the net, it may be useful to look back at its history, and remember the story of Africa’s Father of the Internet. Professor Nii Quaynor graduated with a degree in Engineering Science from Dartmouth College in 1972, he then studied Computer science at the State University of New York, obtaining an MS in 1974 and a PhD in 1977. He also attended Adisadel College and Achimota School in Ghana. Quaynor was one of the founding members of the Computer Science Department at the University of Cape Coast in Ghana, and continues to hold a professorship there. On August 3rd 2013, he was inducted into the internet Hall of Fame.